The third chapter in the RC Plane series brings a whole new engine, realistic physics and a huge scenario to explore at real RC Plane scale! Learn to fly a large selection of RC Planes in huge and beautiful scenarios rich and full of detail. Grab an easy flier to enjoy a majestic sunset over the hills of Tuscany or hop in a fast stunt plane to fly through barns and high voltage pylons. Practice landings, stunts, wind handling and cow scaring or compete on global leaderboards across the many challenging game modes. – Realistic physics using real-life stabilization techniques to help beginners get into the world of real RC Plane flying. – Enjoy a huge (and FREE) scenario and explore 4×4 mile environment on a micro scale. – Realistic FPV and ground camera modes available for pros. – Rich soundscape and beautiful, original soundtrack. – Up to 6 players online free flight and team deathmatch ! – Many leaderboards and challenging game modes to compete on. – King of the week competition grants you a chance for global weekly glory ! – A growing list of game modes and vehicles. 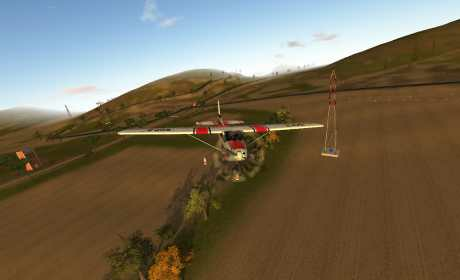 – Drone simulation available in game. – Realtime illumination with realistic Night and Day cycles. – Much, much more to discover in-game. New engine is built to grow, so expect a constant flow of updates bringing fixes, improvements, new game modes, vehicles and scenarios! We’d love to hear your feedback and ideas so please post and share on our forums, comments sections, Facebook , Twitter, Email or even smoke signals:). Your feedback is what makes this game better.